A professional who bats exactly like an amateur. 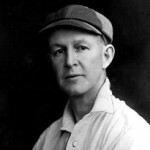 Sir Pelham Francis Warner, affectionately and better known as Plum Warner or "the Grand Old Man" of English cricket, was a Test cricketer. Warner was born in Port of Spain, Trinidad, educated at Harrison College, and then sent to England to Rugby School and Oriel College, Oxford.